Shaz by the Sea: Guest appearance...Chrissy's here! My sister, Chrissy is visiting LA this week and all she wanted was a home cooked meal from her sis. After she hopped off her plane at LAX (with her dream and her cardigan), we went to the grocery store to pick up a few essentials. We decided on chicken and veggies -- but not just any old chicken and veggies. We opted for bacon wrapped chicken, stuffed with spinach and mozzerella cheese. 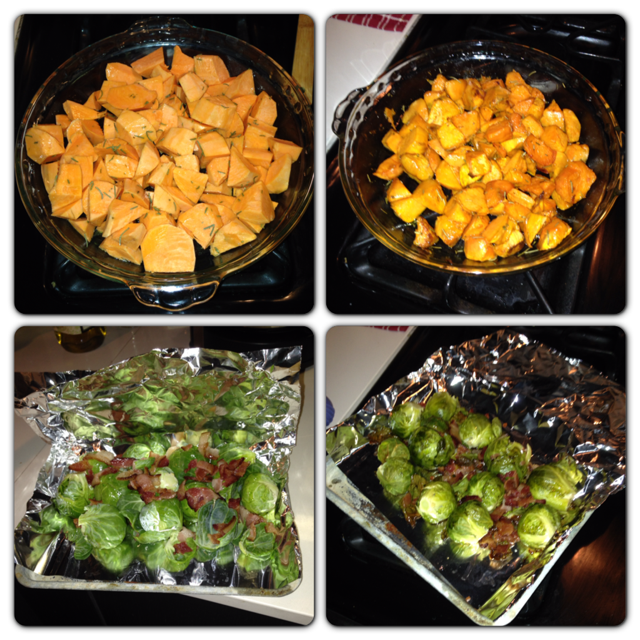 We also cooked some brussels sprouts with bacon pieces and sweet potatoes with rosemary for our side dishes. It was a delish din that hit the spot. Here is a pic of me preppin the chicken breasts...slicing them open to stuff with the fresh spinach and shredded mozzerella cheese. I recommend a smaller opening to actually stuff the chicken, that way it stays more compact. Chrissy did a FAB job wrapping the chicken breasts in the bacon slices we picked up at the meat counter. I was quite impressed. Here I am placing the brussles sprouts in the oven while balancing the chicken in my other hand...quite the multi-tasker. We tossed some EVOO and partially cooked bacon bits in with the brussles and cooked them for about 35-40 min on 325 degrees. As for the sweet potatoes, we drizzled some EVOO on top, added fresh rosemary and tossed it all together. We cooked those for about an hour on 350 in the main oven. Here is a before (left) and after (right) pic of both the sweet potatoes and the brussels sprouts. They were so amazing! While the veggies were cooking, we sautéed the chicken on a low heat (covered) so the thick chicken breasts would cook thoroughly. Instead of coating the pan with EVOO, we cooked the chicken in the bacon fat from the first batch of bacon we cooked -- which was added to the brussels sprouts. After about 40 minutes, we drained the juices and fat from the pan and turned up the heat so the bacon and chicken would brown and crisp, adding some nice flavor. Here's a pic before we drained the juices.